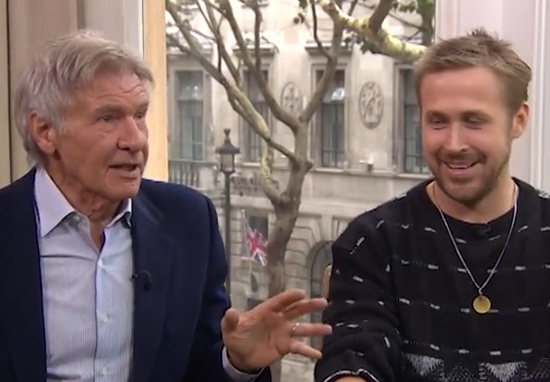 Harrison Ford and Ryan Gosling literally could not stop laughing during a recent This Morning interview. Showbiz reporter Alison Hammond kicked things off to a humorously honest start, as she openly admitted she’d not seen the original Blade Runner, despite being there to interview the actors about their upcoming film Blade Runner 2049. The pair appeared to be greatly amused by Alison’s candid interview style. Bleak, dystopian, an absolute nightmare to be honest with you, and that’s just my interviewing technique. The trio were soon fighting to keep a straight face as they discussed the film, with anything and everything sending them into a fit of giggles. As Alison starts the questions, Ryan starts drinking straight whiskey from an original Blade Runner whiskey glass as he drily remarks ‘I feel like this is where it’s headed’, sparking yet more helpless laughter from the others. Any hope of getting serious answers out of the actors rapidly evaporated faster than the whiskey. Harrison, when you got that call to say ‘listen, we’re making another Blade Runner, and we want you to be in it’, what was your reaction? At this point Alison takes a swig of whiskey too, cheers-ing Ryan as she jokes ‘I needed that’. Lots of people loved seeing this different side to screen legend Harrison Ford, whose characteristically dry sense of humour isn’t always understood. Another person noted: ‘Hilarious, I just think people don’t get #harrisonford he just has a really dry sense of humour he was fantastic on @TheGNShow’. Harrison Ford laughed? Wow, now there's something! Well that was fantastic. I'm fairly sure Harrison Ford has never engaged that much in an interview. Ever. What a genius. Viewers were quick to applaud Alison’s casual yet funny interview technique, which put the two A-Listers at ease. One person tweeted: ‘Bet they haven’t laughed that much in an interview before’ while another commented, ‘she really makes celeb’s at ease, she’s great fun’. Others loved the natural camaraderie between the trio, who, as one Twitter user noted, were acting like ‘3 mates on a night out’. She really makes celebs at ease, she's great fun ? Omg this is the best interview ever there all so down to earth it's like 3 mates on a night out ? It really is impossible to watch this clip and not get the giggles yourself.